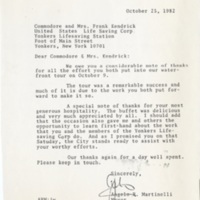 The letter is dated October 25, 1982. 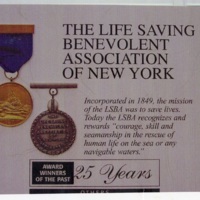 The Life Saving Benevolent Association award was presented to her on behalf of Frank Kendrick. 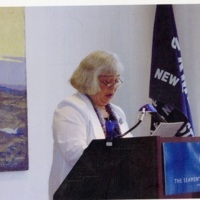 Kay Kendrick was presented this award on behalf of Frank Kendrick. 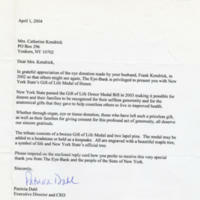 The letter is from The Eye-Bank For Sight Restoration, INC. to Kay Kendrick presenting her with the New York State's Gift of Life Medal award. 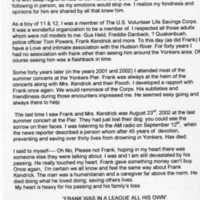 Russell Kleius relays his fond memories of Frank and Kay Kendrick in this letter shortly after Frank's death. 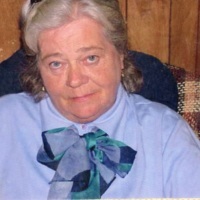 The letter is dated September 15, 2002. Letter to the Herald Statesman about the U.S.V.L.S.C. 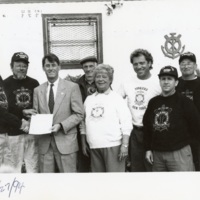 The letter describes how members of the U.S.V.L.S.C., including Frank and Kay Kendrick, rescued Michael & Catherine Amoia and Dennis & MaryAnn Wepfer. The letter is signed by the Amoias and Wepfers. It is dated 1996. Spencer is presenting the U.S. Volunteer Life Saving Corps a certificate of appreciation on behalf on the City Council. 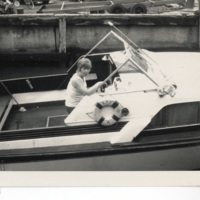 Kay was married to Captain Frank Kendrick. 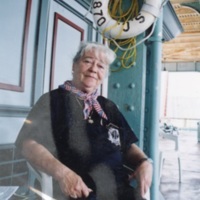 She was also a volunteer in the United States Life Saving Corps for over fifty years.